Today in conclusion to this series I am writing about #10 Poverty Stronghold, Pain Upon Pain. My original doodling of this material, while in Uganda, began with the first 8 strongholds, and then once home and as I was writing my first post about this topic I realized that pain upon pain is a critical contributor to poverty strongholds. In identifying this I thought I would rework the Poverty Stronghold Diagram / Pie Chart to add in pain upon pain, and yet, as I’ve been fleshing out the rest of the material I realized that in fact, pain upon pain is a stronghold that overlays all of the other strongholds; we see that strongholds of Pain Upon Pain are laid over it all, informing and confounding each individual stronghold in turn. 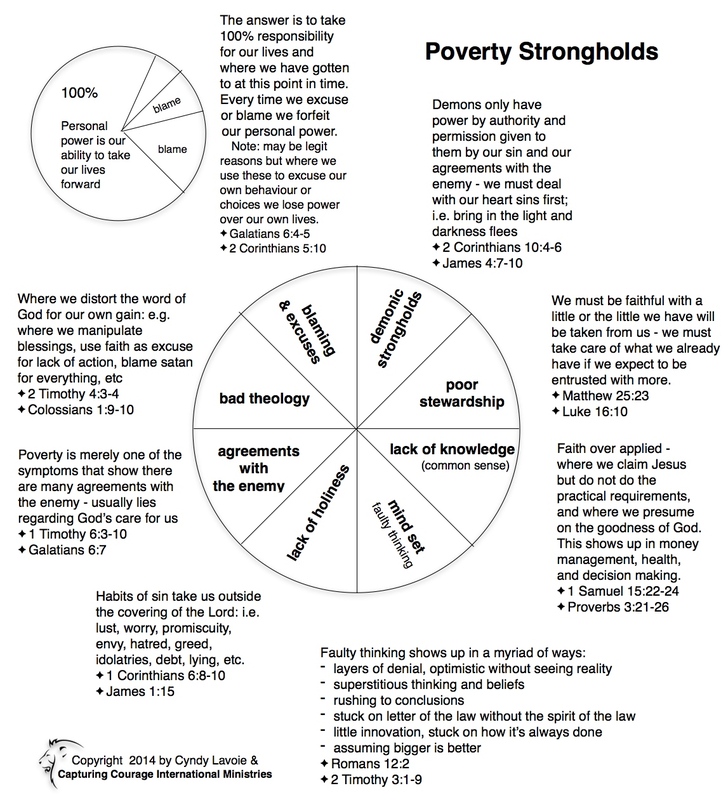 On our original pie chart and in our list of poverty strongholds we had demons as first on the list. This was because the thinking that led to this entire series began with a theology relayed to us of how demons were the entire problem for all poverty and for everything that goes wrong. In a certain area in Uganda we were told that all of the pervasive problems of that region were due to this very large tree that had had a demon in it, and that when the tree was cut down and distributed throughout the entire area the demonic stronghold became established in the entire area. This was the understanding, the belief, the theology. This is what we were told was the entire problem. 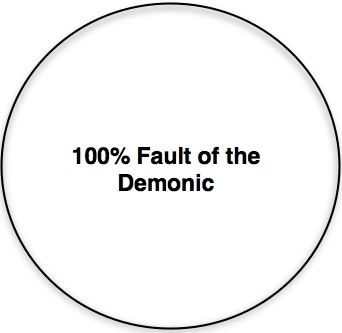 But of course, as a professional people developer and as a prayer minister, I know that if we give all blame (ie:credit) to the demonic we have just given fully 100% of our power away, we’ve become victims and have entered ourselves into apathy and despair. So I roughly jotted out my thinking about this issue with the result being this series of posts. Today, in this series, I finally come to address the demonic factor. Let’s talk about that. I have become convinced that the wide and the narrow roads that Jesus talks about are not in regards to sin per se, but about our response to sin. The Wide Road experiences sin in shame and condemnation and out of that experience works to rid itself of sin. The Wide Road is where we put in good works and our own efforts to try and make ourselves right with God. The Wide Road is where we participate in religion that appeases the Gods, that focusses on self, that works to come clean. The Narrow Road, on the other hand, does not experience sin as condemnation and shame but as a matter-of-fact part of our humanity and our fallenness. The Narrow Road despises the shame and condemnation and instead remains turned toward Jesus Christ the Saviour of our lives. I recently created a diagram to illustrate the work that CCIM does compared to the more traditional and humanitarian aid work that many organizations are involved towards. First off I want to make it plain and clear that there is nothing wrong with humanitarian aid work. For many around the world it is a lifeline that speaks to the reality of God in our midst through the practical help of others. I myself have benefited from practical help through the years. What I learned though, through my own years, is the understanding that for every bad fruit in our lives there is a bad root. Bad fruit does not just come from nowhere, there is always a legal right for that bad fruit to be there. What I mean is this: authority in the spirit realm works by very clear rules and principles with each one of us giving either Satan or God authority in our lives. At CCIM we are called to address the roots of difficulty and despair. 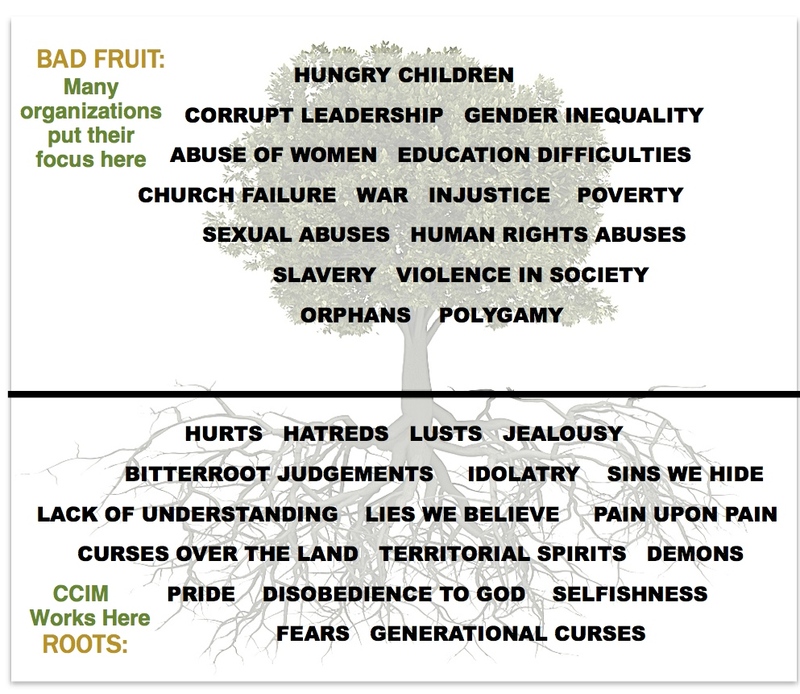 Instead of trying to fix the bad fruit of our lives, our communities, and our nations, we go right to the heart of the matter by breaking down strongholds in the spirit realm, by leading in repentance and honesty before the Lord, and by teaching individuals and communities to stand in the gap for their people in the strength of our Lord Jesus Christ. Identity is important. Who we know ourselves to be brings stability and confidence to our lives and how we walk out our days. Because identity is so important we are easily fooled into identifying with the wrong things. We know of course about those who identify themselves with a licentious lifestyle. We know those who identify and live out drugs and partying and drunkenness and we know that these identities will lead us to death and destruction. So we know to avoid this and to find our identity elsewhere. I learned the power of fasting years ago. It was during the start of my own inner healing journey. I was scheduled for prayer ministry every second week and I made a commitment to myself to fast for the twenty-four hours leading up to and through my appointments. I never really could pinpoint the power of that fasting at the time but I did know the power of those prayer sessions, they changed my life. A few years later a friend was experiencing her own set of prayer ministry yet she confided to me that she wasn’t getting much out of them, that God still seemed distant and her heart was not touched. I suggested that she fast the twenty-four hours leading up to and through her sessions and the next week she reported a profound new depth in her experience of prayer and of healing before the Lord; it was a night and day difference to what had been before. There is something about fasting that removes our coping mechanisms, our veneers, our defences. When we give up food for a time we are brought low in need and the ultimate sort of preoccupation with self. And in that reminder of our hunger we turn to God with a heart serious on receiving His help; we can’t do this on our own. As the years progressed and I began ministering in prayer myself there were many a time when I would awake in a morning and was not really hungry and so I would eat very little. Later in the day I would come to find that so-and-so needs an emergency prayer session and then I would know, “Oh that is why I ate so little today.” Many times the Lord orchestrated my fasting without my prior knowledge. Not only is fasting for ourselves but fasting enters us into spiritual work alongside the Lord Jesus Christ; our understanding is heightened and our perceptions are clearer. In more recent years my fasting has taken on various modes. I rarely fast food any more and I’ve learned not to fast unless the Holy Spirit explicitly directs me. For fasting must never be used as a manipulative tool to get what we want. It is never a good idea to take what worked here and try to make it work there. Our walks with the Lord must never become business, never a product that we transfer from here to there thinking that it worked so well there, why not here? Relationship with God is not something to be taken lightly and so we do not move according to our own best wisdom or ideas and this includes fasting. In recent years as I’ve travelled and ministered overseas each trip is preceded by some sort of fasting. God woos me and invites me to join him and his work, entering into the holy of holies. My first trip was preceded by six weeks of no makeup; no easy feat at the time. Since then I’ve fasted jewelry and tea amongst other things; not easy either if you know me. I find fasting closely linked to a nesting type experience where all of who I am is entered into silence and heart preparation for a spiritual work to come. Because we at CCI move at the explicit direction of the Holy Spirit and not before, this fasting and nesting is in fact one of the first things to alert me to a trip and to ministry to come. I’ve learned to watch for it and pay attention to it; when my spirit hunkers down there is the Lord’s work for me around the corner. Fasting is no longer for myself per se, it’s not by my volition but rather it’s an act of preparation and coming alongside the Lord with a tangible and physical sign and commitment that I agree with what is to come and his use of me; I am glad to be alongside God in this way. He directs it and enables it, enables me. My first trip in 2014 is back to Uganda. We’ve not yet settled on the exact month but I can feel it coming. Thoughts have moved from my mind to my heart and are now settling in my spirit and I’m entering into the nesting and the birthing that precedes a work of the Lord. This bearing of a work is hard work. The heart of God presses down on me and I become his bearer in a way, birthing him. You Cyndy were standing on the shore and I was standing beside you watching …..Then Cyndy you bent down and reached and caught one of people in the river and pulled him/her up. I could not tell if men or women or child was being pulled up with only one hand, so strong you looked, so strong you were. I was afraid for you Cyndy you just kept pulling and pulling crying out “I can’t let go” over and over. and when you pulled we saw that the people were all attached to each other so that that there was a long line of them coming up …how many we did not know .? It seems like never ending…. Then we heard a loud noise coming from where the ugly big people were, and then everything got quiet, and they had disappeared….we saw the water become clearer and all the people you had pulled out started to walk away from you and I. they were singing….loud singing and walking away. You turn to me and said, “You must go home now” and then I woke up. Slowly, bit by bit, I’m finding words for it all. This prophetic dream (just above) was given to one of our prayer partners and it summarizes perfectly the work in the spirit realm and the impact in people’s lives. I am glad for a dream that helps to explain the work, for I’m finding it difficult to put words to what was deep and under the surface. The trip, on the surface, carried no drama and held little spectacle. There was merely four of us (and one little one) traipsing across many kilometres by train and bus, truck and motorbike, and by foot, to visit ten churches, their pastors, and congregations, and then these profound conversations. It began in Chupanga. Our first real stop. We had arrived in the morning and the first service was that evening. I cannot even remember what I spoke on but at the end of the service I was asked to pray for the people. And so this is what I, and my translator Whisky, tried to do. Once I was done teaching Whisky went on with much encouragement’s. All to no avail. It was a bit of a dismal failure from what I could tell. But the evening concluded and back we all went to the house we were staying in. Upon our arrival we found the Pastor and his right hand man already there. How they got there so fast I’ve no idea! And I realized that I just might need to explain why I had refused to pray for their people. So I shared what I had been learning the last few months. I shared the bigger thinking the Lord had been giving me, the conviction to teach the people to do the work of the Kingdom (it doesn’t just belong to a few), how churches grow when people are empowered, what I’ve been learning from the house-church movement in India, and I also shared a prophetic word from one of our pastors in Kenya. I was stunned. Struck. Saddened. In disbelief. And there began hours of conversation, late into the night, about life in Christ, about prophecy, about prayer, about leadership, about marriage, about men and women in the church, about so much. Question after question was directed at me accompanied by a hunger for wisdom and clarity. Long past bedtime we finally broke up our gathering. And then picked it up the next day. That next evening I didn’t preach, we simply held a forum. With Pastor Daniel, Whisky, and myself on chairs at the front of the church Daniel presented question after question, Whisky translated, I answered the question, Whisky translated, and on we went. Life changing conversation that will not fade away. And I still don’t have words for it all. But I’ll keep sharing it a layer at a time. So many dimensions. The Lord is simply at work. This I know. My bag had been packed for Mozambique for an entire year. Literally. Packed and ready to go. For a year’s time. The timing of the work of God is critical to any ministry. It is why we move in sync with the exact leading and timing of the Holy Spirit. Not before, not after. For these works are not of us. In any way. We are simply conduits of God’s heart over people and areas. There are so many things that must align in realms that we do not see, that it is best to simply trust and wait, and then when we hear the ‘go’ we go. Quickly, efficiently, simply. This is God’s work, not ours. 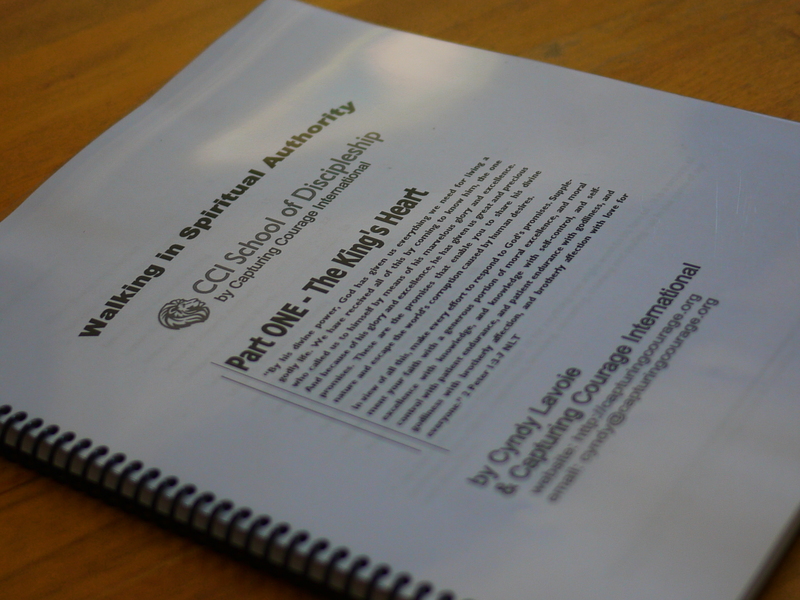 Good news at Capturing Courage – we have completed Workbook Four of our Walking in Spiritual Authority Course and are set to complete part two of the international version for our indigenous colleagues. This will take a good month or more to complete so please keep us in your prayers as we embark on this next task. So far the Capturing God’s Heart material is going out to over 4400 christian leaders, which is in turn being passed on to an estimated 150,000 people. The Spiritual Authority course is currently in the hands of a dozen christian leaders as we test run the material. We simply commit this course to the glory of God and the equipping of his people.